"... The frequency and impact of drug shortages have risen to critical levels, more than tripling since 2005, and affecting all segments of healthcare. In 2010, over 240 drugs were either in short supply or completely unavailable and more than 400 generic equivalents were backordered for greater than five days. In most instances, these did not progress to critical shortages, but point to instabilities in the supply chain that cause national concern..."
"Based on Premier’s current membership of hospitals and other non-acute care sites, using Premier’s Purchasing Partners services, the annualized financial impact of drug shortages where generic equivalent alternatives are available exceeds $78 million... From a national standpoint, the analysis suggests the shortage could cost U.S. hospitals at least $200 million annually through the purchase of more expensive generic or therapeutic substitutes..."
Raw material shortages: Raw material shortages or availability problems can degrade a manufacturers ability to produce enough of a product to meet the demand, e.g. Abbott's problems with Isuprel and Phenobarbital injections. The shortages can result from a number of factors e.g. wars that disrupt imports of raw materials from foreign sources, a sole source manufacturer of raw materials ceasing operations, etc. Natural Disasters: Natural disasters can effect drug production and availability. For example, in 1998 Hurricane Georges hit Puerto Rico, causing major damage. This resulted in several drug shortages as the many pharmaceutical manufacturing facilities on the island were severely disrupted. Packaging problems: A manufacturer may have problems with packaging materials or with FDA approval of packaging or packaging insert changes, that may cause temporary shortages of an item. For example, Bayer has had problems with the packaging of Nimotop capsules that have caused periods of shortage. Drug reformulation: Occasionally a manufacturer may revise a drug's formulation. During the switchover period from one formulation to the next there may be a period of temporary shortage. An example would be when Nabi stopped producing HBIG in 1999 and came out with a new formulation, Nabi HB. This was done to reduce the risk of viral transmission, with the 'new' product undergoing solvent detergent treatment and nanofiltration during the manufacturing process. This resulted in a period of several weeks during which this item was unavailable. More recently, a dexamethasone shortage resulted when a manufacturer changed to a plant source from beef protein following the introduction of European precautions to prevent the spread of mad cow's disease (bovine spongiform encephalothy). FDA actions: Often shortages may result from Food and Drug Administration actions e.g. the temporary shutdown of manufacturing facilities in which the FDA has found problems following an inspection. Until the facilities are brought back into compliance with Good Manufacturing Practices and given a clean bill of health there may be disruptions in supply. Manufacturing problems/changes: Manufacturers may have problems with their manufacturing processes that result in their inability to maintain continuous supplies of a drug. These problems may or may not result in FDA enforcement actions as mentioned above. For example, Pharmacia has recently had problems with its production of Bacitracin for injection. Other manufacturing changes can also effect availability e.g. Schering-Plough has had problems supplying Eulexin due to upgrades to its manufacturing lines that disrupted production. Voluntary Recalls: Occasionally a company may voluntarily recall certain lots of a drug due to paperwork problems or other nonsafety reasons, and this may cause a temporary shortage. Industry/Market Changes: Consolidations and mergers among manufacturers can result in decisions to consolidate product lines or decisions to discontinue the manufacture of certain drugs. Product/Market Decisions: Manufacturers may decide to discontinue the production of certain drugs for many reasons. These may include: diminishing demand, too low or below target profitability, for liability reasons, to utilize resources elsewhere, etc. If these drugs are sole source they are no longer available, if multiple source these market shifts can produce temporary shortages. For example, GlaxoSmithKline PLC recently pulled its Lymerix vaccine off the market due to diminishing demand and increasing consumer criticism. Unexpected Demand or Demand Greater than Supply: Occasionally demand for a drug outstrips a manufacturer's ability to produce it. This may occur when a new drug comes on the market e.g. Enbrel, or when an existing drug starts to be used for a new indication. Restricted Distribution: Some manufacturers have imposed conditions on the availability of certain drugs, generally because of the potential adverse effects of these drugs. An example would be the drug Thalidomide. Originally this drug came out in the 60's and was responsible for the deformities of the "Thalidomide babies", born with vestigial limbs and deformed internal organs. More recently it is back on the market as it has been found to be effective against leprosy, and the weight loss and metabolic wasting of AIDS patients. Another example would be the restricted distribution of Janssen's Propulsid. 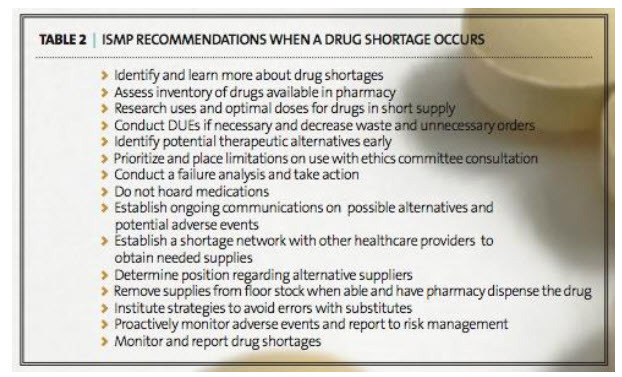 New reasons for market shifts: Occasionally new situations may arise that cause a drug shortage. An example would be the recent bioterrorism/anthrax scares that caused a spike in demand that lead to shortages of Cipro. In 1991 Operation Desert Storm resulted in large quantities of certain drugs (albumin, etc.) being diverted for military use that resulted in civilian shortages. The above reasons are not mutually exclusive and often shortages may result from a combination of factors. For example, in 1999 Ferring discontinued production of Secretin due to manufacturing problems and low demand. As this happened the final stocks of this drug evaporated as demand spiked due to television reports that this drug helped children with autism, making it unavailable for gastroenterologists that needed the drug for diagnostic purposes. The above possibilities may be aggravated by a number of factors. If a drug is a sole source item then any dislocation in supply can result in unavailability of the drug. However, even if the drug is not sole source but manufactured by a small number of companies a decrease in supply by one manufacturer can lead to shortages if the other manufacturers are unable to ramp up production to compensate for the shortfall. The move over the past few years to a just in time philosophy has also resulted in smaller stocks of drugs being maintained at various points along the supply chain, along with end users relying on smaller, more frequent deliveries. The result is that safety stocks are smaller and that temporary drug shortages are felt by the end user faster than before. Advance purchases: If the Pharmacy becomes aware of a possible shortage of a drug then it may be possible to purchase larger quantities than normal of the item to tide one through the shortage. The downside of this practice is that if too many end users do this and order up the last available stock they can exacerbate the situation for other users. There is a fine line between hoarding and attempting to secure a stable supply for the institution's patients. Restriction of emergency loans: When an item has availability problems the Pharmacy department generally will no longer make an emergency loan of the item to another hospital, but will maintain its supply for its own patients. Alternative drug therapies: When a drug is unavailable, patients are put on equivalent products or switched to alternate therapies. Grey market purchases: Very occasionally Pharmacies may be approached by vendors who have stocks of unavailable products that they are willing to sell at inflated prices. This was a common occurrence in 1999 during the shortages of albumin and intravenous immune globulins. Where they had procured these items is somewhat of a mystery. Compounding: Sometimes it is possible to compound the unavailable drug e.g. the compounding of lorazepam solution from the tablet form of the drug, the dilution of 25% albumin to make 5% albumin, etc. Drug company emergency programs: Sometimes during product unavailability the manufacturer might maintain an emergency stock of the item, that will only be distributed on an emergency basis when specific patients are registered with specific indications. Prioritization: During prolonged intermittent shortages it may be necessary to develop a plan to prioritize the usage of a drug based on service, diagnosis, acuity, and other criteria. The bottom line is that drug shortages seem here to stay, so every Pharmacy department should have a specific plan in place to proactively identify these situations as soon as possible, to then communicate the relevant information to all interested parties, and to have a portfolio of responses that can be brought to bear in an attempt to limit any adverse impact on patient care.